Find My Workspace lists over 95% of the serviced offices market in Upper Mount Gravatt. Simply click Request Quote to check pricing for one office, or Add to Basket for multiple offices. 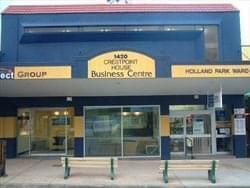 This is a fantastic opportunity for serviced office space in the thriving Mount Gravatt central area. Very suitable for a health professional or accountants. This centre offers several professional rooms available to lease monthly or permanently on busy Logan Road. Current tenants are psychologists, councillors and professional businesses. It is located on two levels with a reception and greeting area on the ground floor. This is a great environment to have a business presence if you are currently operating a home business. To obtain information for your selected Upper Mount Gravatt Serviced Offices, please tick the "Add to basket" box for each office you prefer and complete the form below. We will then send a detailed report via email.